The lateral joints of the body are the most mobile, complex and subject to injury. They form a deceptively interrelated chain of movement and function in which malfunction of one component can and often does affect the others. The kinetic chain of lateral joints consists of the temporal mandibular joint, shoulder, sacroiliac, hip, knee, ankle and foot joints. Integral in the kinetic chain are the muscle, tendon and joint mechanoceptors. They supply the continuous sensory input to the brain regarding the status, function and coordination of the individual components of the chain. Proprioceptive dysfunction caused by injury, postural stress, joint dysfunction and muscle splinting must be reset to normal if any lasting spinal or extremity correction is to be achieved. The functional relationship of lateral joints was recognized decades ago by SOT founder Dr. Major DeJarnette. He said, “Lateral joints affect lateral joints and central joints affect central joints.” The validity of this concept becomes apparent the more you work with the kinetic chain and observe how the correction of foot, ankle and knee positively affects the hips, sacroiliacs and shoulders. The interrelationship of the sacroiliacs and shoulders is frequently observed during the pre and post arm fossa tests which are monitored during SOT Category II blocking for sacroiliac slippage and separation. One of my most recent cases is a perfect illustration of this interrelationship. When I performed her initial right arm fossa test as part of the Category II testing protocol, I found her right shoulder and arm to be very weak and painful. When I rechecked the same arm fossa test only a few moments later after the blocking was completed the arm and shoulder tested perfectly strong and without pain, much to the patient’s amazement. While I have no doubt that the shoulder needs repair, its connection to the sacroiliac subluxation is irrefutable. I am confident that the Category II correction that I did will help assure a more successful outcome for this patient’s shoulder repair surgery. The strengthening and reduction of shoulder pain after Category II corrections of the sacroiliac is a common occurrence for me and other SOT practitioners. Correction of TMJ dysfunction often has a positive effect on problems involving the shoulder girdle. In some cases the entire kinetic chain from the foot, ankle, knee and sacroiliac to the TMJ can be involved in shoulder problems. This possibility should always be considered since shoulder problems are among the most difficult and persistent issues we confront. Malfunction among the numerous components of the kinetic chain of lateral joints is an illustration of what experienced chiropractors know: If we only investigate and treat the site of pain we are likely to miss as much as 85% of the cause of our patients’ problems. The temporal mandibular joint (TMJ) is the superior most component of the lateral kinetic chain. The TMJ influences more neurological function than any other joint. It is richly endowed with a variety of mechanoceptors which provide the most sensitive and intricate of all proprioceptive information to the brain. The action of the TMJ maintains the opening of the eustacean tube to equalize the internal pressure of the middle ear with the outer environment. Failure of this mechanism causes otitis media, the painful inflammation with fluid and pressure that builds up in the middle ear when the eustacean tube is closed due to TMJ dysfunction. A lesser known but equally important function of the TMJ is to activate the micro movement of the sutural joint system of the skull. Failure of the balanced movement of the cranial sutures leads to elevated intracranial pressure and associated cranial nerve dysfunction, migraine and cluster headaches and vertigo. The TMJ interacts functionally with the cervical spine and can become a complicating factor that must be corrected to permit complete and lasting cervical corrections. A recent case of an 80 year old female who was referred to me by her medical doctor is a good example of TMJ involvement affecting the upper cervical spine. When she was 12 years old she had a right side head and upper cervical injury that caused a severe concussion. In spite of a lifetime of chiropractic care, the persistent pain in her right occipital/atlanto/axial area was at best only partially and temporarily relieved. This painful condition persisted and sabotaged her health and wellbeing for 68 years. The extreme chronicity of her condition was apparent in the thickening of the cervical musculature, hypertrophy of the trapezius and congestion of the suboccipital tissues and line fibers. These splinting and guarding mechanisms caused severely limited cervical and thoracic movement and resistance to correction. The Quantum Neurology® Rehabilitation protocols for the trigeminal, vegas and spinal accessory nerves allowed immediate improvement of cervical range of motion and relaxation of the para-cervical musculature, the trapezius and SCM. This in turn allowed effective TMJ correction which, in conjunction with an instrument adjustment of atlas, gave an immediate and lasting level of relief that she had never before experienced. I am certain that without the cranial nerve and TMJ correction, my upper cervical adjustment alone would not have been effective, just as it had not been for the other chiropractors who had tried to help this woman over the past seven decades. The traditional admonition of “find the subluxation, fix it and leave it alone” applies in uncomplicated cases. But in very chronic and complex cases, as in the example above, we must entertain the possibility of other neurological and structural components as being contributors to the movement disorders and pain that many patients experience. The objective of all chiropractic correction is the re-establishment of the alignment of the six spinal motor units (as described in the Pettibon Spinal Model) and the restoration of full freedom of motion. This is unlikely to happen without correction of any faults in the alignment and motion of the entire kinetic chain. Any part of the lateral kinetic chain can influence and affect any or all of the other parts of the chain. To achieve complete body balance, coordination and comfortable freedom of movement, the entire kinetic chain of lateral joints must be integrated and aligned. The reciprocal arm and leg movement seen in the walking gait of a normal, healthy person illustrates interrelated and coordinated upper and lower extremity movement. Conversely, when we observe someone who exhibits absent, limited or unequal reciprocal arm and leg movement, it strongly suggests neurological as well as structural inhibition and imbalance. I have thus far discussed the upper lateral chain consisting of the TMJ and shoulder girdle. The seven joints of the pelvis, the two 5L-S1 facets, sacroiliacs, ileo-femoral joints and the symphysis pubis, form the junction of the appendicular and the axial skeleton. I have written extensively about the importance of balancing the pelvis in my articles The Pelvic Imperative and two part article The Comprehensive Examination and Correction of the Pelvis, previously published in The American Chiropractor. The kinetic chain of the lateral joints of lower extremities includes the lateral joints of the pelvis, the sacroiliacs and ileo femoral joints, as well as the knees, ankles and feet. Any alteration in alignment or motion at any point in the kinetic chain will necessitate compensatory changes in alignment and motion of the joints above that point. If we do not address faults of the foot, ankle and knee, our correction is likely to be incomplete and compromised. The foot and ankle form an amazing complex, a Rubric’s Cube like arrangement of 26 bones and 36 joints. These must fit properly together to function and move well. The foot has three arches, the lateral, medial and transverse, which are critical to the flexibility and shock absorption of the feet. The four bones that make up the knee are key components of the same kinetic chain. The extreme leverage exerted by the long bones of the leg, the femur, tibia and fibula, apply tremendous force to the hip, knee and ankle joints and can magnify the affects of even a small misalignment in any of the involved joints. The kinetic chain of the lower extremity is first evaluated generally and then in detail. First observe the lateral relationship of the joints of the hip, knee and ankle. They should be aligned vertically. Next observe the A – P alignment of the upper leg to the pelvis and the upper leg to the lower leg. Is the patient bow-legged or knock kneed? Do the feet flare out or in? Do the feet pronate or supinate? Like the alignment of the spine, the alignment of the bones and joints of the lower extremities are of utmost importance to the overall structural correction. Because of the length of the upper and lower leg bones, even slight deviations of the proximal or distal ends are magnified at the opposite end. This causes excess friction, heat and inflammation. The pizeo and pyro electric charges that are generated are caused by a separation of electrical charges at the surface of the joints, ultimately causing the deposition of calcium and destruction of the articular cartilage. This is the leading cause of the osteoarthritis we see in our patients. On A – P pelvic views, if there is DJD of the hip joint it is almost always on the anatomically or chronically functional long leg side. This is because the hip joint on the long leg side experiences more pressure and wear and tear with each step than does the short leg. Correction of foot, ankle and knee misalignments and fixations is extremely important. To accomplish this I use both manual and instrument techniques which are very difficult to describe in writing. I teach these in my classes on Integrated Advanced Chiropractic Techniques and will soon have videos available. The feet are the “footings” of the skeletal structure. When the foot is properly mobilized and the subtalar joint adjusted, I often find the residual effects of old ankle sprains are corrected as well. After correcting imbalances in the feet and ankles, the knees must be addressed. There are potentially two dimensions involved in knee misalignments, posterior translations and rotations. Posterior translations of the tibia and fibula can be adjusted manually or with instruments. Rotations of the tibia are best corrected using the ArthroStim instrument. Correction is achieved when the anterior tubercle of the tibia is positioned directly below the center of the patella. Above the knee in the kinetic chain is the ileo femoral joint or femur head. Dysfunction of the femur head involves the posterior and anterior joint mechanoceptors, which may be misfiring on one or both sides of one or both hips. For proper afferentation to the motor cortex via the spinal sensory pathways we must reset the mechanoceptors on both anterior and posterior sides of the femur heads. The best way I know to achieve this is via the anterior and posterior femur head corrections which are part of the Gonzalez Quantum Neurology® Rehabilitation techniques. Next we move up to the sacroiliacs, which are most efficiently corrected by SOT Category II blocking. Once the foot, knee, ankle and hips (femur heads and sacroiliacs) are properly adjusted we have successfully realigned the kinetic chain of the lower extremities. The restoration of normal freedom of motion and coordination of all of the joints of the lateral kinetic chain as well as the restoration of spinal alignment should be the goal of chiropractic corrective care. The joint systems of the axial and appendicular skeleton are functionally interdependent and must be addressed if whole body correction is to be achieved. 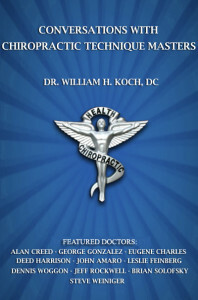 Chiropractic has never been a profession for wimps. Historically, the profession has attracted rugged individualists. Today, even though it is a well-recognized and respected profession and part of the mainstream, it takes a unique individual to pursue a chiropractic career. I first began thinking of myself as a healing martial artist about 30 years ago. The similarities between chiropractic and the martial arts became apparent to me when I began studying the various martial arts. Prior to being asked to interview him, I did not know Dr. George Gonzalez and had not heard of Quantum Neurology® so I had no pre-conceived idea of what it was about. This proved to be a good thing, because it meant that he had to walk me through its rationale and development. I found Quantum Neurology® to be a truly new and unique chiropractic methodology. It is not a remake of any other technique. Its focus is neurological as opposed to the structural focus of other techniques. The most frequently asked question I get is: What does it take to get licensed in one of the island nations? Living “the island life” is the fantasy of many people especially in winter when the temperature dips and the snow is flying.